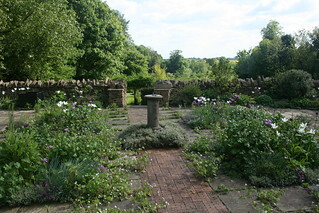 We are a 4 acre garden developed over the last 16 years from a green field site by the owners. There are now in excess of 3,000 varieties of trees, shrubs, perennials and bulbs filling the garden in varied areas including herbaceous borders, bog garden, woodland, meadow and ornamental vegetable garden. The garden is planted for all year round interest from mass plantings of snowdrops, aconites and hellebores in winter to late summer interest from grasses and late flowering perennials. Much of the planting is drought resistant as the garden is free draining and sloping down through the meadow to the bog garden and wildlife pond. The garden is cultivated on organic grounds and always with wildlife in mind. With the advent of grandchildren the woodland garden is now dotted with surprises for children and a playhouse with slide. No open garden this year, we are having a year off but hope to open again next year.